TEHRAN, Iran (AP) — Iran is bracing for the restoration of US sanctions on its vital oil industry next week, as it grapples with an economic crisis that has sparked sporadic protests over rising prices, corruption and unemployment. The oil sanctions, set to take effect on Monday, will target the country’s largest source of revenue in the most punishing action taken since the Trump administration withdrew from the 2015 nuclear agreement in May, and will also affect Iranian shipping and financial transactions. The United States has already restored sanctions on Iran targeting financial transactions involving US dollars, Iran’s automotive sector and the purchase of commercial airplanes and metals, including gold. The White House insists the sanctions are not aimed at toppling the Islamic Republic, but at forcing Iran to dramatically alter its policies in the region, including its support for militant groups across the Mideast and its development of ballistic missiles. The U.N. nuclear agency says Iran is complying with the nuclear deal. The renewed sanctions have already taken a heavy toll, with the rial losing half its value since April and the prices of fruit, poultry, eggs and milk skyrocketing. Protests erupted across the country in December, with some demonstrators chanting against the government and clashing with police. Sporadic demonstrations have been held in recent months, including strikes by workers, teachers and truck drivers. The nuclear accord struck under the Obama administration — and also signed by Britain, France, Germany, China and Russia — lifted crippling international sanctions in exchange for Iran curbing its nuclear program. Western countries had long suspected Iran’s nuclear program masked the covert pursuit of atomic weapons, allegations denied by Iran, which has always insisted its nuclear activities are for energy and other peaceful purposes. After the agreement took effect in 2016, Iran began exporting its oil more freely and signed billion-dollar agreements with Airbus, Boeing and other Western firms. 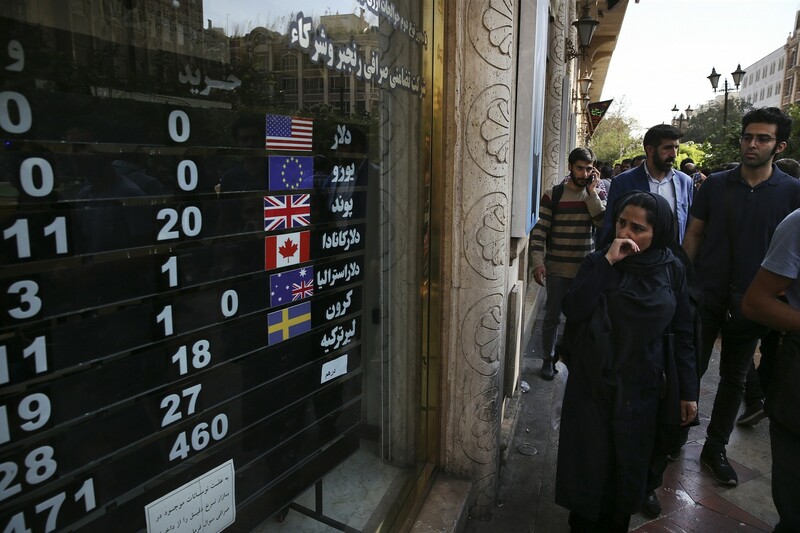 But the legacy of decades of sanctions and economic mismanagement remained, and the nuclear deal’s future was thrown into uncertainty with the election of President Donald Trump, who had repeatedly vowed to exit the deal and finally withdrew in May. Starting Monday, the Trump administration has promised that companies that fail to comply with the sanctions will be barred from doing business in the US Although Washington might grant waivers to countries like China and India, which are among the biggest importers of Iranian crude, the expectation is that the US will demand substantial curbs on how much is imported. “The government will utilize its entire capabilities to alleviate the problems,” he added. In an effort to circumvent the sanctions, Iran began selling some of its oil in an energy stock exchange on Sunday. 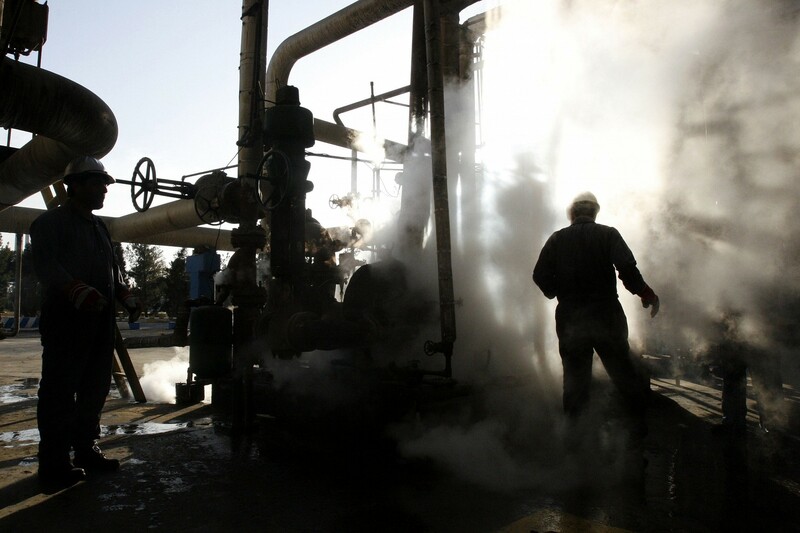 Iran’s Oil Minister Bijan Zanganeh said 280,000 barrels were sold on the IRENEX exchange as of Wednesday and that 720,000 barrels will be provided later. But the 1 million barrels a day Iran intends to sell in the exchange — which foreign dealers can access — is a fraction of the peak 2.5 million barrels a day that Iran sold before the Trump administration announced the re-imposition of sanctions. European countries, which remain committed to the nuclear deal, have discussed taking measures that would shield European companies from the US sanctions and allow them to keep doing business in Iran. But thus far they have been unable to prevent an exodus of major firms, including Boeing and Airbus, which suspended the aircraft purchases. General Electric, Maersk, Peugeot, Renault, Siemens, and Total have also cancelled business deals in Iran, according to the Washington-based Atlantic Council. Despite the unraveling of the nuclear deal, Iran is still complying with it, and appears to be waiting out Trump, hoping his successor rejoins the agreement. In the meantime, the renewed sanctions risk further undermining Rouhani, a relative moderate, and strengthening hard-liners distrustful of the West, the International Crisis Group said in a report this week. The message was delivered by Israel’s deputy national security adviser Eitan Ben-David to Orléan la-Chevalier, a top adviser to French President Emmanuel Macron, during the latter’s visit in Jerusalem on Monday, according to Israel’s Channel 10 news. Ben-David asked that la-Chevalier deliver the message to Lebanese Prime Minister Saad Hariri. France has close longstanding ties with Lebanon, and is considered close to Hariri. Largely funded by Iran, Hezbollah remains popular in Lebanon, where it has transformed into a potent political force allied with President Michel Aoun. Many politicians have balked at calls to force Hezbollah to disarm. Aoun recently denied a claim by Prime Minister Benjamin Netanyahu that Iran was upgrading Hezbollah missiles at secret facilities inside Beirut, taking journalists and diplomats on tours of some of the alleged sites several days later. Netanyahu had revealed the sites during a speech at the United Nations General Assembly in a bid to spur international action. He claimed the technology would allow the missiles to hit within 10 meters (32 feet) of its target. Last month, Fox News reported that Iran had delivered advanced GPS components to Hezbollah which will allow the terrorist group to make previously unguided rockets into precision guided-missiles. Israel has warned repeatedly about the threat of Hezbollah precision-guided missiles, and has carried out numerous airstrikes inside Syria to keep advanced weapons from being transferred to the terror group. Reports that Iran was constructing underground missile conversion factories in Lebanon first emerged in March 2017. 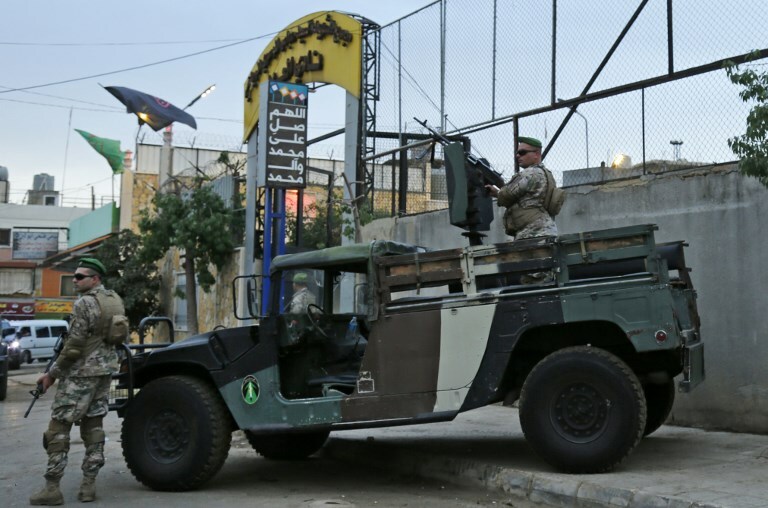 Lebanon “is becoming a factory for precision-guided missiles that threaten Israel. These missiles pose a grave threat to Israel, and we will cannot accept this threat,” Netanyahu said in January. Israel and Hezbollah fought a war in July 2006 that saw thousands of missiles rain on northern Israel. Since then, the terror group is thought to have expanded its arsenal to over 100,000 rockets, with the ability to strike almost anywhere in the country, though only a small number are thought to have precision guided capabilities. The Israeli Air Force has largely abstained from conducting raids inside Lebanon itself, though it has indicated that it was prepared to do so. Earlier this year, air force chief Amiram Norkin showed visiting generals a picture of an Israeli F-35 stealth fighter flying near Beirut, in what was seen as a direct message to Hezbollah. Prime Minister Benjamin Netanyahu on Thursday night called Iran the “most potent force of militant Islam” in the world and warned Europe of possible Iranian attacks on its soil. Speaking to reporters after talks with his Bulgarian counterpart, Boyko Borissov, Netanyahu said radical Islam is a threat to the world, and that Israel has recently revealed a number of Iranian plots to carry out attacks on European soil. He said Israel and Europe “stand together” in the face of such attacks. Israeli officials said Wednesday that the Mossad intelligence service had provided its Danish counterpart with information concerning an alleged Iranian plot to assassinate opposition activists in its territory. Netanyahu arrived in Bulgaria’s Black Sea city of Varna for Friday’s meeting of the Craiova Forum, which includes the prime ministers of Bulgaria, Greece and Romania, as well as the president of Serbia. Ahead of his trip, Netanyahu said he wants to strengthen ties with these countries and “change the hostile and hypocritical approach of the European Union” toward Israel. The premier said he would discuss with Bulgaria’s prime minister cooperation on military matters, trade, cyber-security, health and science. “Israel is an innovation nation and it can help the people of Bulgaria and the other countries here by cooperating in ways that will help us and will help you in every field,” he said. 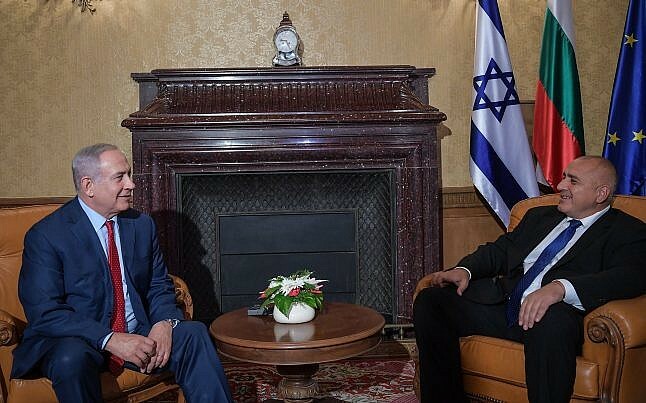 Netanyahu said the purpose of the visit was to strengthen Israel’s relationship with Balkan nations, but also to promote his agenda with the European bloc, which he has long chastised for what he claims is an anti-Israel bias. Netanyahu didn’t specify which of the EU’s policies he takes issue with, but he has previously been at loggerheads with the bloc over the Israeli-Palestinian peace process and the Iran nuclear deal. Members of the coalition and some in the opposition also often claim that the union treats the Jewish state unfairly and often stands on the wrong side of history. Brussels’ adamant opposition to settlement expansion and to Israel’s demolition of Palestinian structures, as well as European funding of leftist nonprofits, have angered right-wing Israelis for years. Israel’s ties with the 28-member state union significantly worsened after the EU’s November 2015 decision to label settlement products. In its initial anger, Israel suspended contacts with the EU, but soon reinstated them. There were other signs of a detente, for example when a senior official in Brussels said in late 2016 that the union was willing to reconvene the EU-Israel Association Council, a bilateral forum on ministerial level, after a five-year hiatus. But relations quickly went south again. In July 2017, Netanyahu was overheard, during a visit to Budapest, calling the EU “crazy” for insisting on linking the advancement of bilateral ties to progress in the peace process. Tensions were exacerbated after US President Donald Trump’s December 6, 2017, recognition of Jerusalem as Israel’s capital, a move the union vehemently opposed. Brussels also assumed the role of chief defender of the Iranian nuclear deal after Trump announced the US’s withdrawal from the landmark pact on March 8. Brussels not only condemned the president’s move but also vowed to protect European companies from reimposed sanctions. Israeli attacks on the union have since increased in frequency and intensity. Ministers openly accuse the EU of funding anti-Israel boycottsand even organizations with terrorist links. The bloodstains were still fresh at the Pittsburgh synagogue where 11 Jews had been murdered when Jews turned on other Jews, casting blame on the opposing political camp rather than the murderer • When the Left accuses the Right, what does it gain? Israel will mark the 23rd anniversary of the assassination of Prime Minister Yitzhak Rabin this weekend. The question is whether this year, like every year, the commemorators will once again accuse a large portion of the Israeli public of being responsible for or having contributed to the murder. I will be very pleasantly surprised if they don’t. There are people in Israel who just can’t help it. Despite having made a historic contribution to our resurrected statehood, a large camp has chosen, consciously or subconsciously, to consistently cast blame on the rival camp. It is a fundamental political principle for them. It is as though they believe the only way to gain the public’s love is to make the public hate the opposite camp by demonizing it and painting it as the enemy. The irony is that this camp keeps decrying all the “incitement” against them. This is not a disagreement, it is a hate-fueled fight, and it is preventing any kind of serious debate between the sides on the issues that need debating – anything to avoid bringing up the devastating failure of the previous haphazard peace accords. What does the Left gain from all this? The Bible, the foundation that props up our nation, tells a story of a fight between Abraham’s shepherds and his nephew Lot’s shepherds over grazing lands and water sources. The verse describing the fight adds that “the Canaanite was then in the land.” The other inhabitants of the land looked on with glee as Abraham’s family quarreled. They thought, let the Hebrews fight among themselves; it will spare us a war. A millennium and a half later, when King Alexander Jannaeus’ sons Hyrcanus II and Aristobulus II fought over their father’s kingdom, the Romans were summoned to rule in favor of one or the other, and Jews invited international intervention and asked the empire’s “security council” to impose order on the Jewish nation. That is how we lost our independence. Even during our long exile, in the various valleys of death, there were Jews who could not help but criticize their Jewish rivals. As they were succumbing to the enemy, they accused their Jewish brethren of what the actual enemy was about to do to them. Last Saturday, Jews were massacred by an anti-Semitic murderer, who shot them while they prayed to the Jewish God. Before murdering them, the shooter expressed his hatred toward all Jews, wherever they may be. It is impossible not to be rocked to the core by such heinous acts. Ostensibly, sorrow at the tragedy was uniform among all Jews, reminding us of the bond between us. But a deeper look revealed that this was not the case. Even before the bloodstains could be washed away, the usual complainers rose up and accused the rival political camp of being responsible for the massacre. It is difficult for radical liberals to contain anti-Semitism. It is a stain on their universal identity. That is why they rush to rid themselves of it by casting it on others. One commentator went a step further and concluded that the Israeli government’s values are more in line with those of the murderer than with the values of the Jews he murdered. Appalling. Before he finished making this outrageous claim, another fool – a professor with severe moral narcissism whose main focus is on his moral behavior without taking the big picture into account – lashed out at Diaspora Affairs Minister Naftali Bennett. The professor contended that Bennett, who set off to console the survivors of the shooting, had no right going there because he is more like the murderer than the victims. Absolute insanity. The people who make these kinds of remarks and the newspapers that provide a platform for such views (Haaretz, for example), are known for backing the Palestinians’ aspirations to establish a Palestinian state on the ruins of Jewish communities in Judea and Samaria. Some of them even view the very existence of Israel as an unforgivable sin, because its existence comes at the expense of the Arabs who were there before. Would anyone even consider suggesting that the people who express these views have more in common with terrorists than with the thousands of terror victims who have been murdered, burned and massacred over the years? The murderers of Jews don’t need any excuse to carry out their plots, incidentally. And of course U.S. President Donald Trump is to blame too, because he is an anti-Semite or because he supports anti-Semites and neo-Nazis. He is responsible for the “atmosphere” that encouraged the massacre. When will this tired gang of pretentious children give it a rest? Trump is the most pro-Israel president in the history of American presidents; his daughter and grandchildren are Jewish; he relocated the U.S. Embassy to Jerusalem, publicly recognizing Israel’s right to its capital; he sent his representative to the U.N. to attack its anti-Israel bias and hypocrisy; he defended us in an unprecedented manner; he recognized the terrible injustice and suspended funding to UNRWA, accusing it of perpetuating the Palestinian refugee problem; he withdrew from the international nuclear agreement with our sworn enemy Iran, and ratcheted up American sanctions on Tehran – all this and you think the president is anti-Semitic? How obtuse, alienated and detached from reality do we need to be to actually take such claims seriously? Now they’re going after Brazil’s president-elect, Jair Bolsonaro. According to them, some of Bolsonaro’s past remarks warrant severing ties with the massive country he now heads. Fortunately, the people who think this way aren’t in charge of Israel’s foreign policy. Do they think that close ties with other countries and their leaders mean that we accept everything they say and do? The reality is a little more complicated than that. Bolsonaro likes Israel and wants to learn from us to strengthen his own economy and defense. This ensures robust trade relations between Israel and Brazil. Unfortunately for the detractors, he also promised to relocate the Brazilian embassy to Jerusalem, without balancing the move out with a payout to the Palestinians. In fact, he spoke harshly of the Palestinians, comparing them to a Colombian terrorist organization. Bolsonaro’s critics talk about applying morals to international relations – that would be well and good if those same people hadn’t given their seal of approval to the biggest murderer of Jews since the Holocaust – Yasser Arafat – as Israel’s partner for peace. So Arafat yes, but Bolsonaro no? The Haaretz reporter who made the unfortunate comment is not an influential voice, but it is her precisely her place in the margins that proves the unbearable lightness within her social circle with which the political story supersedes the human story. Just like in the cases of the previous two writers. They don’t see the tragedy. They don’t see Jews whose lives were taken. They see a political story that needs to be steered in the “right” direction. This politicization has taken over Israeli culture and academia and has destroyed them. There is no area that can escape this group’s political judgement. Like a fanatic cult, they espouse their moral superiority, comparing it to their political rival’s moral corruption. This attitude serves only to increase the public’s disdain for them. Hamas said it will lower but not stop violence to give Egyptian mediation a chance. The IDF is bracing yet again for more Friday violence along the Gaza border fence, even amid reports of progress in Egypt- and UN-mediated efforts to restore quiet to area. Hamas and Islamic Jihad leaders met in Gaza and reportedly decided to lower the level of violence, though not stop the weekly protests at the fence. Following a meeting that included Hamas leaders Ismail Haniyeh and Yahya Sinwar, the various Palestinian factions – including Hamas, Islamic Jihad and the Popular Front – issued a statement saying that the “March of Return,” which began on March 30, will continue but without violence along the fence and incendiary balloons, and that protests are to be held at a distance of 500 meters from the barrier. An Egyptian intelligence team – which has been at the center of effort to restore calm to pre-March levels – was in Gaza on Thursday. Palestinian Authority President Mahmoud Abbas is scheduled to meet Egyptian President Abdel Fattah al-Sisi in Sharm el-Sheikh on Friday. His decision to cut off funding to Gaza has, according to Israel, fueled tensions in the Strip. The apparent decision to tamp down the violence follows Israel’s agreement to allow Qatari-funded fuel to enter the Gaza Strip, to allow funds from the emirate to pay Hamas salaries and to extend fishing rights along the Gaza coast. Earlier this week, a senior diplomatic official made clear that Israel would work with various international actors – including Qatar – to prevent a humanitarian crisis in Gaza and try to restore quiet to the area without having to embark on a major military offensive. The official also said that last week the sides were on the cusp of an agreement, but they had dissolved with Friday’s violence at the fence and Islamic Jihad – acting on orders from Syria – firing a barrage of nearly 40 rockets at Israel. Both Egypt and the UN hope to create a long-term understanding, or even a cease-fire, that would ease the humanitarian situation for the two million people living in Gaza and prevent further outbreaks of violence between the IDF and Hamas. Egyptian negotiators have also proposed a three-year agreement to reconcile the rival factions of Hamas in the Gaza Strip and the Fatah-led Palestinian Authority in the West Bank, according to an Army Radio report. The proposed agreement would be enacted in stages. The PA would first take responsibility for civil services and the government ministries in the Gaza Strip that are now under Hamas control. In its second phase, the PA would be in control of the police and the border crossings. If all went well for three years, Hamas’s military wing Izzadin al-Qassam would be placed under PA control as well. Separately, elections would be held for a new Palestinian parliament and a new constitution would be drawn up, according to Army Radio. The plan was designed by Egypt’s Gen. Ahmad Abd al-Khaliq, who has made four trips to Gaza and the West Bank in the past two weeks to secure agreements for the plan. He has also met with senior Israeli Defense Ministry officials. The Egyptian plan includes detailed timetables and formulas for each stage. Hamas is prepared to consider the plan but is waiting for a response from Abbas. Abbas in the past has rejected any plan that did not immediately place the security services under his control. He fears that any plan that maintains a separate security force for Hamas makes it more likely that the West Bank and Gaza could become two separate entities rather than one unified state, according to Army Radio. The Gaza powder keg again was ignited this weekend as thousands of Palestinians converged on the security fence for Friday’s installment of the so-called “March of Return” protests, which, as has been the case for six months, descended into mass chaos resulting in the deaths of at least four rioters. Then, beginning in the evening, sequential rocket salvos kept residents of southern Israel in bomb shelters for twelve hours while the army responded by striking scores of sites belonging to Hamas, and, more significantly, Islamic Jihad (IJ). In fact, while the Israeli government ultimately holds Hamas responsible for all violence emanating from the territory it controls, the Israel Defense Forces nevertheless explicitly blamed the latter wholly owned Iranian subsidiary for launching the missiles, alleging that “orders and incentives were given from Damascus with a clear involvement of the Revolutionary Guards al-Quds force.” Late Saturday morning IJ unilaterally declared a cease- fire, a message conveyed to Jerusalem via Egyptian intermediaries already attempting to forge a long-term truce between Israel and Gaza’s rulers in order to avert a fourth major conflict in the past decade. Accordingly, many analysts have attributed IJ’s aggressiveness to a desire on the part of Tehran—a master at fomenting and then harnessing instability to its geopolitical advantage—to torpedo these efforts. Notably, the move follows the transfer by Russia to the Assad regime of the advanced S-300 defense system, which has partially curbed Israel’s freedom of action to target Iranian military infrastructure in Syria. This all comes on the backdrop of reports that the Islamic Republic delivered sophisticated GPS components to Hezbollah that will enable it to transform inaccurate projectiles into precision-guided missiles, thereby increasing their threat to the Jewish state. During a September speech to the United Nations General Assembly, Prime Minister Binyamin Netanyahu sounded the alarm over Hizbullah, revealing satellite imagery of three sites in Beirut where Iran’s underling allegedly has built underground manufacturing facilities to produce missiles capable of hitting within a few meters of practically anywhere in Israel. Last week, the IDF accused the Shiite terrorist group of operating a fake environmental NGO in order to illegally maintain a presence in the buffer zone separating Lebanon and Israel. Finally, Israeli media claimed Hizbullah is working to construct forward- operating bases in the Syrian Golan Heights just a few kilometers from the border with Israel, a development that, if true, casts serious doubt over Moscow’s purported guarantee to prevent the militarization of the frontier. Taken together, these circumstances suggest that Iran has become sufficiently emboldened to increase its proxy war against Israel. That said, while there are obvious acute concerns for Jerusalem, some observers are construing Tehran’s lashing out as evidence of the mullahs’ desperation amid civil unrest at home; ahead of the re-imposition of American sanctions on their country’s crucial oil sector; and as the United States-led alliance to counter the regime takes shape. “As far as recent events go, the Iranians are like a cat in a corner and will try with whatever means they have in order to secure their continuity. 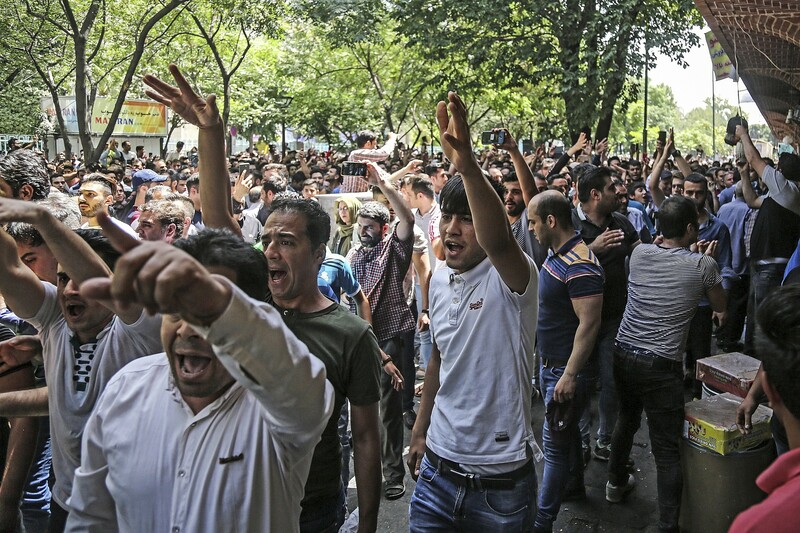 They are facing daily mini-uprisings and they are very, very concerned,” Dr. Alireza Nourizadeh, Director of the London-based Center for Iranian and Arab Studies, explained to The Media Line. “The upcoming measures in November are a nightmare for the Iranians as they are not 100 percent sure what President Trump will put on the table and how far he will go. Will there be a total ban on Iran’s oil exports, including [to such countries as] India, Japan and others? Everything is unclear and there are differences between the teams of President Hassan Rouhani and Supreme Leader Ayatollah Khamenei. “In terms of what to watch for,” Dr. Nourizadeh imparted, “the Iranians are blocking the formation of [Lebanese Prime Minister] Saad Hariri’s cabinet, but if he is able to form one next week this could be a sign of compromise on [Riyadh’s part]. Also, Oman’s Sultan Qaboos [who in the past has acted as a conduit to the Iranian regime] hosted Prime Minister Netanyahu which also could be the start of a small rapprochement. Otherwise, I fear there will be very dark days to come.” As regards Jerusalem, specifically, the government seems intent on leveraging its burgeoning diplomatic ties with the Sunni-Arab world in order to stymie Iran’s hegemonic ambitions. This would, by extension, at least for the time being reduce the probability of a conflagration along any one of three Israeli borders where the Islamic Republic has allied fighters stationed at the gates. Indeed, Prime Minister Netanyahu on Friday made a public visit to Oman—the first by an Israeli leader to the Sunni Gulf nation in over two decades—after which Muscat called for the Jewish state’s regional integration irrespective of the amount of progress made towards achieving a peace deal with the Palestinians. Concurrently, Miri Regev became the first Israeli minister to pay an official visit to the United Arab Emirates, where an Israeli delegation is being permitted (as opposed to last year) to compete under its own flag in an international judo event. This, as U.S. President Donald Trump appears committed in the wake of the grisly murder of journalist Jamal Khashoggi to maintaining strong bilateral relations with Saudi Arabia, which along with Israel is a centerpiece of the White House’s foreign policy goal of rolling back Iran’s expansionism and potential nuclearization. “The most important problem for Israel is [not Islamic Jihad in Gaza] but Iran’s military intervention in Syria,” Dr. Col. (ret.) Ephraim Kam, a Senior Research Fellow at the Tel Aviv- based Institute for National Security Studies, stressed to The Media Line. “Previously, the Israeli army had the advantage as its capabilities are superior to those of Iran, but this could change with the S-300 system [in Syrian hands]. The big question is how this will impact on the IDF’s [maneuverability] and everyone is waiting and see.” That the Israeli military did not react to IJ’s attacks this weekend by targeting Iranian assets in Syria, coupled with the IDF’s reported lack of activity in that country since the downing last month by Syrian forces of a Russian reconnaissance plane, which the Kremlin nonetheless blamed on Jerusalem, is perhaps a telling indication of the emergence of a new, restrictive dynamic. “With respect to Oman,” Dr. Kam continued, “Iran was almost certainly discussed but [Muscat] likely cannot help Israel much. On the other hand, The Trump administration’s approach is a big problem for the Iranians. He has backed out of the nuclear agreement, re- imposed financial penalties and has supported Israel [unequivocally] in its confrontations with the Islamic Republic. The regime does not understand the American leader and lacks an answer to his [unpredictability]. Accordingly, there is a chance Iran will be deterred moving forward.” To paraphrase Orwell, then, Tehran’s strong maneuvering against Israel—including in Syria, Lebanon and, most recently, in the Gaza Strip—may, in reality, be a short-term manifestation of a rising fear of its prospective weakening. “Israel is a sovereign state and we shall duly respect that,” Bolsonaro writes. Brazil intends to move its embassy to Jerusalem, the country’s president-elect Jair Bolsonaro announced on his Facebook page on Thursday, wasting no time in declaring intent to implement one of his campaign pledges. Bolsonaro is a populist, ultra-conservative, Evangelical Christian whose victory Sunday signified a stunning shift in the direction of Brazil which has been ruled for the last 15 years by the far-left Workers Party. It also represents a tectonic shift in the country’s relationship with Israel. “Israel is a sovereign state. If you decide on your capital city, we will act in accordance. When I was asked during the campaign if I’ll do it [relocate the embassy] when I was president, I said yes, and that you’re the ones who decide on the capital of Israel, not other people,” he said. In the past, Brazil was among those countries that almost always voted against Israel in international forums. Prime Minister Benjamin Netanyahu phoned Bolsonaro shortly after his election victory to congratulate him, and said that he intends on attending his inauguration on January 1. If Brazil does indeed go ahead with the embassy move, it will join the United States and Guatemala, who took similar steps. Paraguay also moved its embassy, but then quickly changed its mind following a change of presidents there and moved its embassy back to Tel Aviv.